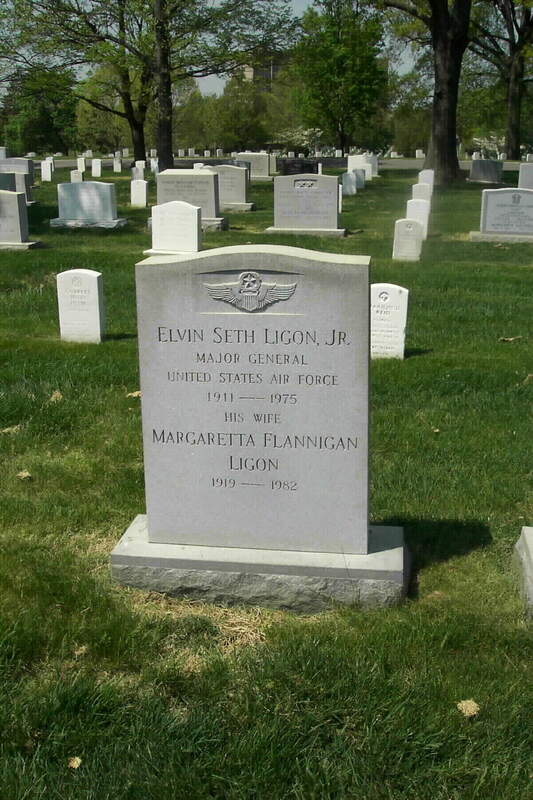 Elvin Seth Ligon Jr., was born in Fork Union, Virginia, in 1911, son of a school teacher and later principal of Bolles School, Jacksonville, Florida. After graduating from Blackstone Military Academy, Virginia, and attending the University of Richmond for three years, he entered the U.S. Military Academy in 1930. Graduated a second lieutenant in June 1934, he entered primary flying school at Randolph Field, Texas and, a year later graduated from the advanced flying school at Kelly Air Force Base, Texas. Second Lieutenant Ligon's first assignment was at March Field, California, where he held duties until 1938 as assistant squadron operations officer, flight commander, squadron assistant navigation officer and airplane commander. Then followed five and one-half years of assignments to Air Corps technical training installations, including Chanute where he completed the Maintenance Engineer Course, Scott, Sheppard, Tulsa, Greensboro and St. Louis. Assigned to command the 466th Bomb Group (Heavy), B-24's in the Eighth Air Force located at Attlebridge, England, General Ligon's group was deployed intact to the United States in June 1945 to be re-equipped with B-29s and moved to the Pacific. The group was at Sioux Falls, South Dakota, on V-J Day. After duty as deputy base commander at Buckley Field, Denver, Colo., in September 1945, General Ligon attended the first Command Course at Command and General Staff School, Fort Leavenworth, Kansas, moving to the Technical Training Headquarters at Scott Field, Illinois, in February 1946. He was assigned as an observer to the "Baker" test at Bikini, then as a student in the Air War College in June 1946. After graduating a year later he remained at the War College as an instructor until November 1947 when he was reassigned to the Alaskan Command and Alaskan Air Command Staff. 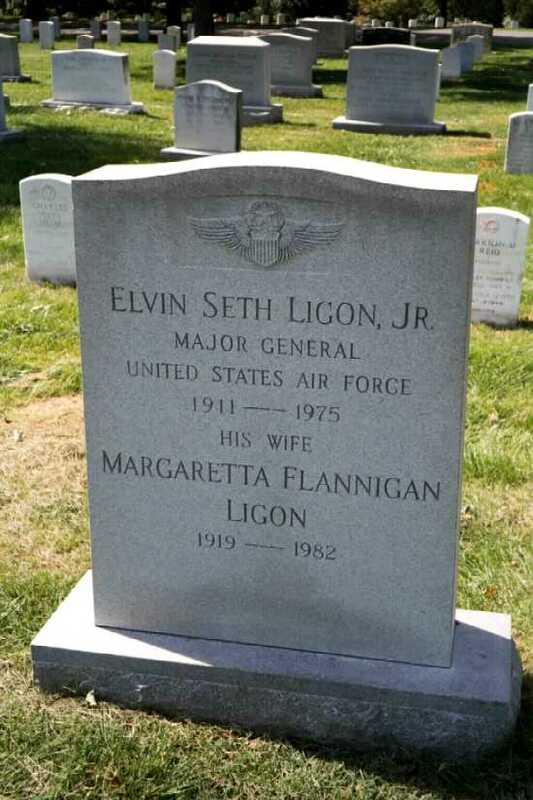 Returning to the United States in August 1949, General Ligon was assigned to the staff of the Air War College, Maxwell Air Force Base, Alabama, serving as a special project officer, director, academic staff, and special assistant to the commandant, respectively. Going to the National War College in August 1952, Ligon graduated a year later. After a short tour with the Security Service he joined the Director of Plans, Deputy Chief of Staff/Operations, U.S. Air Force, and in December 1955 became deputy director of personnel planning, becoming director on September 10, 1956. He assumed command of the 3500th U.S. Air Force Recruiting Wing, Wright-Patterson Air Force Base, Dayton, Ohio, July 1951, remaining in that position until July 1959 when he was assigned as director of personnel planning, Deputy Chief of Staff for Personnel, Headquarters, U.S. Air Force. In August 1961, he was appointed chief of staff, Chief Military Planning Staff, CENTO, Ankara, Turkey, and in July 1963, assumed his present position as chief of staff, Allied Air Forces Southern Europe, Naples, Italy. His decorations include Commendation Ribbon; Legion of Merit with oak leaf cluster; Distinguished Flying Cross; Air Medal with oak leaf cluster; Bronze Star Medal; Meritorious Service Unit Insignia and Croix de Guerre with palm from French Government. 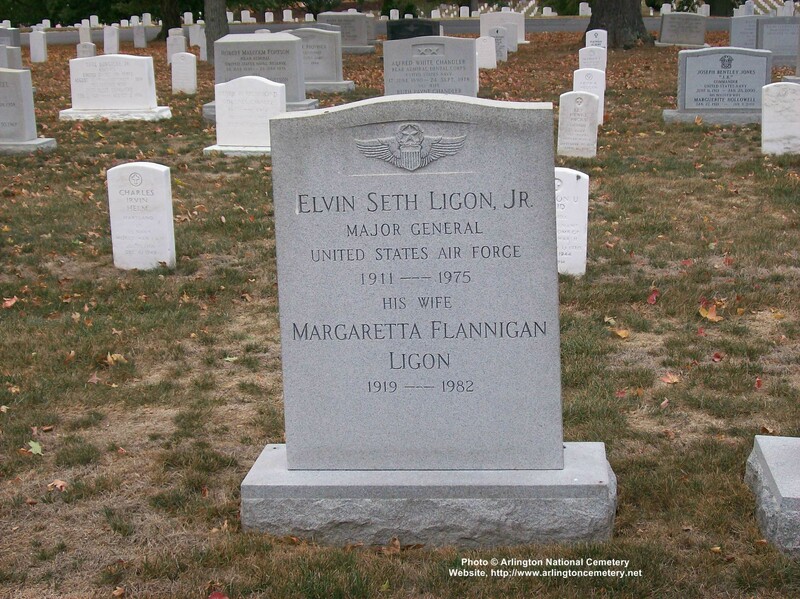 General Ligon was buried with full military honors in Section 11 of Arlington National Cemetery.